Scanners paid for from charity cash are being left idle for hours on end - because some hospitals cannot afford to pay all the running costs. About £40m of lottery cash has been spent in the past four years to buy more than 50 magnetic resonance imaging (MRI) scanners for hospitals across the country. And while many hospitals are able to use the equipment to treat patients every day, other units are struggling to even get the expensive equipment up and running. Yet waiting times for the MRI scans, which can detect cancer, stroke and other health problems, have soared to up to 18 months in some places. Indeed, the government has recently signed a five-year contract with private firm Alliance Medical Ltd to fill in the gaps. Now, officials representing radiologists are meeting the Department of Health (DoH) to help increase the use of the permanent scanners. 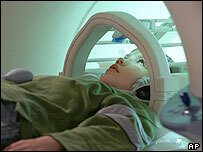 182 MRIs in place before April 2000. Dr Paul Dubbins, from the Royal College of Radiologists, said: "We are in discussion with the DoH as to how we can utilise the spare capacity that may exist throughout the country." Richard Evans, chief executive of the Society of Radiographers, said scanner running costs of about £250,000 a year were not taken into account by the charities or even the DoH when they spend money on the equipment. He told BBC News Online: "Up and down the country there are very many places where there is much mothballing of MRI capacity or where it is used as back up, or not as well as staff would like to use it. They combine a powerful magnetic field, radio waves and a sophisticated computer to produce detailed pictures of the inside of the body. "But an MRI scanner is pretty much an independent provision, there is quite a lot of political kudos in the huge investment in capital equipment. "The problem lies with making sure it is properly resourced." He said while consultant radiologists were in short supply the number of radiographer graduates was growing and they could take additional roles. Cash for many scanners has come from the National Lottery's New Opportunities Fund, which gave money for sophisticated hospital equipment. BBC News Online spoke to the 19 English hospital trusts awarded cash from the National Lottery's New Opportunities fund to buy scanners - many were still battling to find cash to run the machines as often as they would like. One hospital with problems is The Royal Bolton, in Greater Manchester, which is treating patients with a mobile scanner while its own machine is often switched off. It should run for 10 sessions a week but the trust can only afford six. Ann Schenk, a hospital director, has said running costs had "to compete with other priorities" and a shortage of trained radiographers did not help. She told BBC News Online: "It may well be the case that, for some developments, it is not always possible at the point of making the case for investment in equipment to have a precise source of revenue secured." Hospital chiefs in Shrewsbury, Shropshire, also claim lottery officials did not check the hospital could afford to cover ongoing costs before handing over £800,000 for its machine. 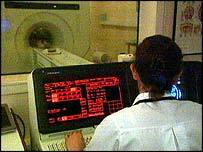 The scanner at the Royal Shrewsbury Hospital could now be out of action for months because this year's budget cannot cope with the running costs. Nick Webb, director of finance at Shropshire County Primary Care Trust, said: "As far as I can ascertain we never formally signed up to pay the revenue." But Vanessa Potter, a director at the Big Lottery Fund, said: "The sustainability of diagnostic equipment is a matter for determination by local partners and in particular for Primary Care Trusts (PCTs). "The fund expects grant recipients to set out plans for sustainability, and we work closely with the DoH and other stakeholders to ensure this." She said no further lottery cash was being provided by the MRI programme. A spokeswoman for the Department of Health admitted the problem was not unique to Shrewsbury and Bolton but denied they were simply providing the machines for public acclaim. "We are actively dealing with it by bringing new staff through and new equipment is now coming on line but the trusts are committed to funding it afterwards," she said.